Trump Surveillance Flap Throws Monkey Wrench Into House Russia Investigation The top Republican and Democrat on the House committee investigating Russia's election meddling traded charges about snooping and partisan bias — threatening its nascent investigation. House Intelligence Committee Chairman Devin Nunes speaks to reporters after a meeting at the White House on Wednesday. Explosive accusations and countercharges on Wednesday threatened to derail one of Congress' investigations into the potential connections between President Trump's 2016 campaign aides and Russia's meddling in the election. The Republican chairman of the House Intelligence Committee, Rep. Devin Nunes of California, announced that he had learned that then-President-elect Donald Trump and some of his staff had been caught up in U.S. surveillance of foreign targets overseas in the months after the election. Nunes cited information he said was brought to him by credible sources — but did not share it with his fellow Republicans or with the Democrats on the committee. Instead, after making an announcement to reporters at the Capitol, he traveled to the White House because, he said, he needed to brief President Trump. 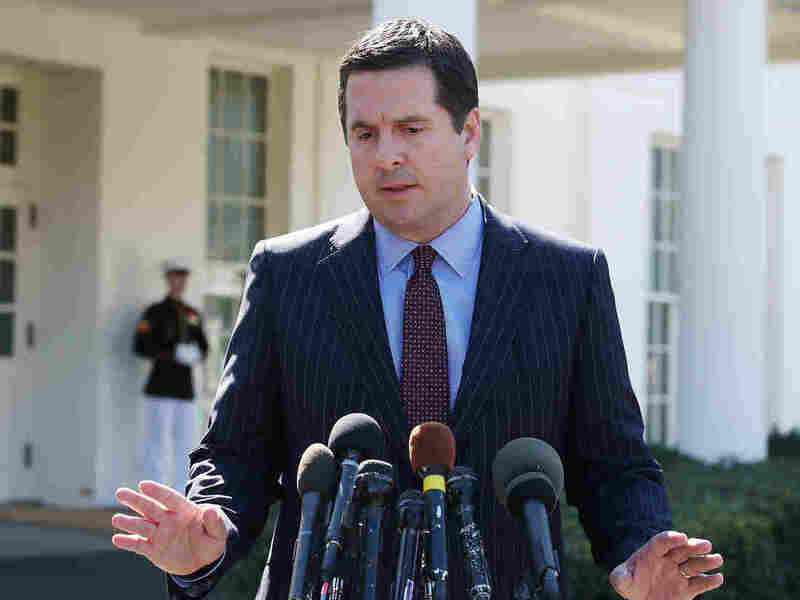 Then Nunes talked to reporters again outside the White House and returned to the Capitol, where he finally discussed his charges with the top Democrat on the House Intelligence Committee, Rep. Adam Schiff, a fellow California lawmaker. Schiff used a late afternoon press conference to denounce the "extraordinary" conduct by Nunes, saying Nunes had damaged any hope that the regular House Intelligence Committee could pursue a credible, bipartisan investigation into the Russia connections. Instead, Schiff said, Congress must impanel some kind of special committee like the ones it has created after crises in the past, including the terrorist attacks of 2001. "Today's events have underscored the imperative of an independent commission," Schiff said. The twist in the story represented another bizarre zigzag in the often surreal soap opera involving Trump, Russia, the election and his campaign aides. Nunes' charges followed a report earlier in the day by the Associated Press that former Trump campaign chairman Paul Manafort had been paid millions by a close ally of Russian President Vladimir Putin to draft a strategy to improve Putin's image in the West. And the back-and-forth Wednesday came only two days after FBI Director James Comey told Nunes' committee that his investigators have been looking into Trump aides' connections to Russia since last July. "I have to hope this is not part of a broader campaign from the White House to deflect from the director's testimony this week," Schiff said. Nunes called his actions appropriate given that the material he viewed did not involve Russia and because as chairman of the House Intelligence Committee, he was doing his job. "The president needs to know these intelligence reports are out there and I have a duty to tell him that," Nunes said. But Schiff complained that Nunes did not share whatever material had been brought to him with anyone else on the committee and that all he, other lawmakers and the public had to go on were Nunes' comments. The chairman's revelations served to partly vindicate Trump's March 4 claim on Twitter about being incredulous that President Obama had sunk to "a new low" by ordering a wiretap of his phones before the election. Trump's Republican allies — including Nunes — and Comey all had said there was no evidence of any wiretap. But Nunes said Wednesday his discovery did prove there was more general surveillance of Trump and his camp, apparently as part of legal and routine monitoring by U.S. intelligence of foreign targets overseas. Not only that, Nunes said, the names of Trump and aides were "unmasked" by American intelligence officers — revealed openly in their classified reports as opposed to being listed as, for example, "U.S. Person 1." Such names can be revealed to help analysts and decision-makers understand what to make of what American spies have collected, but Nunes charged that the intercepts he had viewed weren't important enough to justify that. Schiff, in his response, said that so-called incidental collection doesn't necessarily mean that American intelligence hears a U.S. person talking on the phone to a foreign target. It could involve two foreign spies saying the name of a U.S. person. Schiff also said he understood that most of the names in the intercepts were properly "masked," and that Nunes was complaining because the context of the material made it easy to deduce the identities of the people under discussion. By sunset on Wednesday the issue had become a truth vacuum — nearly impossible to verify definitively because of the secret nature of the material and the secondhand nature of the accounts about it. Nunes' accusations help Republicans strengthen a narrative about discontented Obama administration dead-enders abusing their powers to spy on the incoming Trump team and, in some cases, leak details about them to the press. A report in the Washington Post describing intercepted conversations between former national security adviser Michael Flynn and Russian Ambassador Sergey Kislyak ultimately forced Flynn to resign. Republicans want the investigation that Nunes' committee is leading to be about these issues — information security, leaks and the press — which is all ground on which they feel comfortable fighting. A second hearing, scheduled for March 28, is set to include Obama-era appointees, and Nunes' disclosure gives Republicans who make up the majority on the committee a new weapon against them. Democrats, however, want the House Intelligence Committee probe to be about Trump's connections to Russia, like those in the AP story about Manafort and those laid out Monday in an extended opening statement by Schiff. Nunes' public charges and visit to the White House on Wednesday raise the prospect that Democrats might not go along with any future proceedings to protest what they perceive as the partisan bent of the committee's investigation. Then the question will become whether Republican leaders, including House Speaker Paul Ryan, would appoint a special independent panel to investigate their own president.